The M7 Monitoring System is the most accurate, versatile and cost-effective way to manage road striping and applications. Now, you can know what product you are applying, where you are applying it and how much is being used, without ever getting out of the truck! M7 Systems were designed to better control the efficient use of paint and materials, saving time and money when striping paved surfaces. These versatile controls let you decide from a wide array of measurements. M7 integrated controls incorporate today’s striping equipment with tomorrow’s technology. The M7 patented system is the only monitoring system in the United States that measures all material usage based on weight. It brings truck data in real time to a PLC, programmable logic controller, so that the driver can maintain proper application rates and adherence to specifications. If you can’t monitor your costs, you can’t control them. The M7 Monitoring System tells you what materials you are using and what you have left in REAL TIME! It does not simulate the use of material, as do competitive products. The M7 gives you accurate, reliable information to use in managing roadway striping jobs. 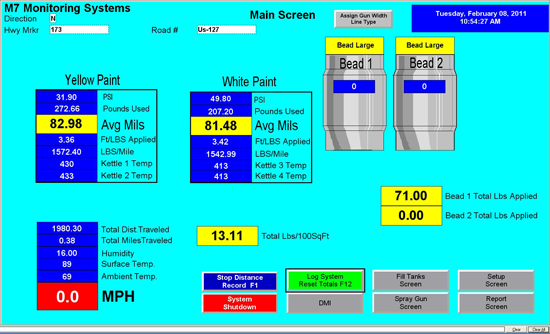 REAL TIME PAINT STRIPING MATERIAL MEASUREMENT — RIGHT NOW! The M7 patented system is the only system of its kind in the U.S. It records the actual weight of material in your tanks. Load cells are installed under each tank to record the live weight of the system tanks at all times. In addition to the load cells that measure weight, the M7 provides for the alternative method of counting the number of strokes the pump performs and the amount of material used per stroke. It also gather data on weight and strokes per gun, distance traveled, line width and length per gun, ambient temperature, surface temperature, humidity, dew point and product temperature. The operator monitors what is happening in REAL TIME — RIGHT NOW!There is no need to stop to check tanks. The driver knows how much material is being used and how much is left in the tanks with very precise measurements. This feature alone can get jobs done faster, as well as improving your safety records. The M7 uses the best load cells, sending the most precise and reliable data to the operator, saving time and money. Because it measures actual material used, not estimates or projections, the M7′s output is accurate to the fraction of a gallon or pound. The programmable Logic Controller, PLC, receives and analyzes data for easy retrieval on the driver’s laptop. The many measurements, along wit specific calculations and analyses,can be tailored to your specific jobs or situations. 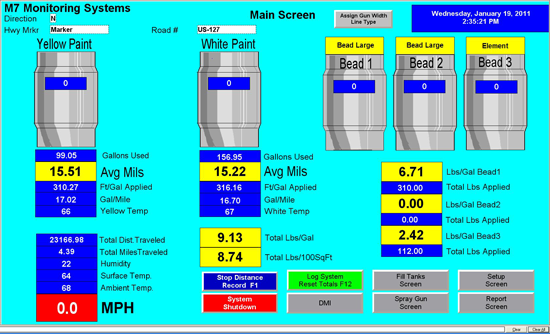 All of these measurements can be used to calculate points of beads per gallon, paint line thickness in mils or anything else relevant to your job. The M7 Monitoring System is a way to really get any job under control. You can set up your own information needs for easy viewing, allowing for trouble shooting before small variances from specifications become serious problems. You can stick to those specs, have data for reports later, and modify settings as you go along. Less time saves money. The programmable logic controller, or PLC, is the brains of the system. It receives data, computes it, calculates what you need to know, and reports it. These versatile controls let you decide from a wide array of measurement tools and calculations, i.e. ‘programmable.’ It can control 3 guns, 6 guns or up to 24 guns. It works on pressurized or airless striping equipment and runs on 12 volts of electricity. The load cells send data to the PLC that analyzes data and makes calculations quickly. Then it sends the findings to an Excel file on a laptop computer in the cab of the truck. You can even get a portable printer to make hard copies and prepare DSL reports. The GPS system capabilities allows you to track exactly where you are on the job and on the map. 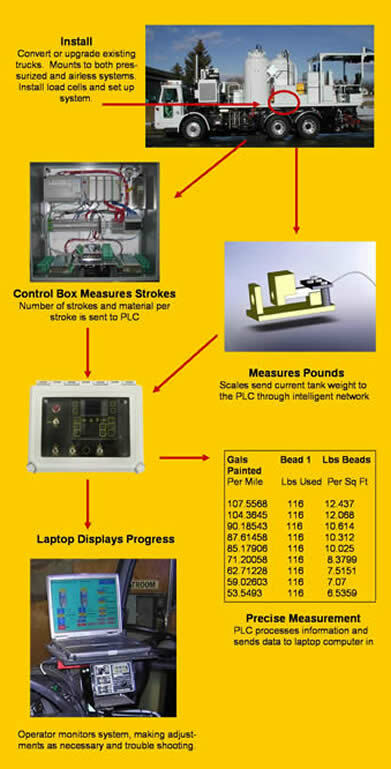 The PLC computes data and maps it out for you to use. Manage striping jobs more effectively with this revolutionary technology. 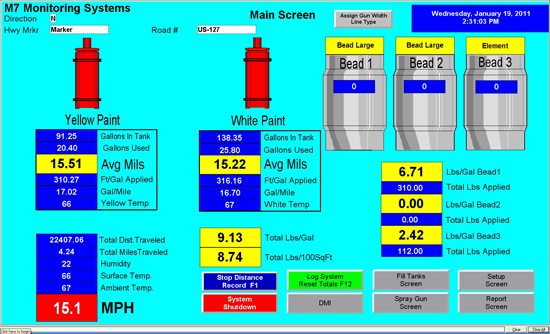 The PLC makes calculations, analyzes data and sends reports to the computer screen in the cab of the truck, so the driver can effectively manage the use of materials while driving down the road. Reports can be programmed to provide data tailored to your needs, the present job or your equipment. Reports can be printed on a portable printer.